In this tutorial I will show you how to configure free, auto-renewing SSL certificates for WordPress websites that are hosted on Google Cloud Platform using the Bitnami version of WordPress on Google Cloud Platform. Luckily for you, this step-by-step tutorial is super easy to follow. All you have to do is follow along with the video as I install an SSL certificate for my domain eborchids.com. Once you’ve connected to your instance, we will run the commands below to tell Apache to install Git. The Sudo -i command will put you in root mode, and the apt-get command will tell Apache to download Git. Press “ENTER” after entering each command. Now that you’ve installed Git, we will enter the “cd /tmp” command to navigate to our temporary file directory. Next, we will run the “git clone …” command to download the certbot files. In this step, we are going to generate our certificates. Based on the picture, figure 1 represents the command to access your certbot directory. Figures 2 and 3 are part of one command, where 2 is the path to your website’s root directory, and 3 is your website’s domain name. Before setting up auto-renewal for our certificates, we are first going to run the function below in order to test the auto-renew function. Next, we will use the crontab command to set a schedule for checking for renewals. Then, we will enter 1 to choose nano as our text editor. Next, we will enter a command that tells the server to check for certificate renewals two times per day. After entering the command, press ctrl+o to save changes to the file. The next step is to configure your certificates. We will run the first command to enable root access, then the second command to edit our bitnami configuration file. Now that we've entered the Bitnami configuration file, deactivate the existing certificates by placing a # next to them. Below, copy your new certificate paths and paste them into the file with shift+insert. Next, we need to paste the following 3-lines of code below the VirtualHost_default_:80 section of the bitnami configuration file. This will tell the server to always serve our website's pages with HTTPS encryption. After adding this code, enter ctrl+o to save changes, followed by ctrl+x to exit back to our home screen. 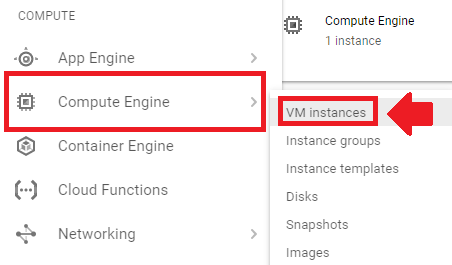 From your Google Cloud Platform dashboard navigate to "Compute Engine" > "VM Instances". Visit the domain where where you installed the certificate. If your SSL certificate isn't working, check your configuration at www.ssllabs.com/ssltest/. Because we configured auto-renewal for our certificates, we don't ever need to renew them or setup new ones. When you say cd && you are missing the directory to cd into (/tmp/certbot/) so the path to ./certbot-auto will not be resolved and the command will always fail. This is probably one reason why the users in the comments above, like me, failed to have auto-renew succeed. This is reflected in your subsequent posting here: https://www.onepagezen.com/letsencrypt-auto-renew-certbot-apache/ but it might be useful if you could update the above info as it might save some trouble for people. Note that the Apache restart also seems to be required and this is not listed as a requirement for auto-renew. Thanks for bringing this to my attention. I’ve been meaning to update the tutorial, as you’re correct that the crontab won’t work correctly. After i have completed this video my WordPress dashboard is not longer safe to view. It says that the certificate is invalid. My website is completely fine. Check that your certificate is configured correctly with SSL Checker. Feel free to share the output from the SSL test, and I will see how I can help. I am not sure why but when trying to access the terminal from the VM instance (when clicking “SSH”), the new window loads saying that it’s “Transferring SSH keys” and then it completely blanks out and no text loads in the terminal. Why would this be happening? Hi Bobby – can you please include a link with an image of the error? I did those steps few month ago, it worked awesome, but few days ago I sow that my certificate is expired and I wonder probably I missed a step for adding auto renew. Can you help me with that please? Did you configure the auto-renewal according to the instructions here? If not, use those instructions for configuring the certificate auto-renewal. Glad to hear it – thanks for the feedback Victor! Did you replace mysite.com with your actual domain name? Also – is your website online/accessible via the browser? If your website is offline and not accessible via HTTP then Certbot will be unable to validate your domain name. When I go to the WordPress Dashboard the site is secure and appears a padlock in the search browser, but when I go to visit the site it appears with a https url but no more padlock, instead there is a warning sign and it says: “your connection to this site is not fully secure ” . Those are probably insecure content errors, which I cover in this tutorial. Hi, thanks for this excellent tutorial, everything worked perfectly! However, at step 7, since I have wordpress Multisite installed, I did not have those lines. I tried like this and it works fine, should I be concerned? just doing cd, it cds into ~ (home), and the certbot-auto file is in /tmp/certbot/, no? Maybe I should move certbot out of /tmp into /etc? You will have to move certbot out of the tmp directory or it will be deleted. Check out the instructions in this tutorial for more information. I used bitnami do deploy my webpage. At the last stage of SSL Certificate Setup, red https error appears. I faced same issues in my previous webpages, but I solves the issues with your help. This time again I need your help. I used click-to-deploy in my previous webpages. As you see below, it says there is a syntax error on line 54. But when I check the command line 54 it seems there is no error. Do you have any idea how I can solve the problem? To fix the issue, I would recommend using this solution posted by CJ. I tried to follow the steps you mentioned but this time some different issues appeared. “You appear to be behind a NAT router. Please configure the passive mode settings and forward a range of ports in your router. At the same time, bellow error appears on SSH page. I tried to apply the rules you mentioned, but nothing happened. I hope I do not bother you. git clone https://github.com/certbot/certbot in step 3 is no longer working. Can you help advise what I should do? It doesn’t look like I can continue the instruction without completing this step. Use the updated version of the tutorial here. Sir, I have an SSL certificate provided by Godaddy. I want to link my WordPress bitnami website to this SSL certificate. How to link? I was trying to generate CSR but failed. Please suggest some step, so That I can Solve it. The process for configuring a ‘paid’ certificate is different from the steps outlined in this tutorial. You will have to generate a CSR, forward it to GoDaddy, then wait (usually 12-24 hours) for them to issue you your certificates. 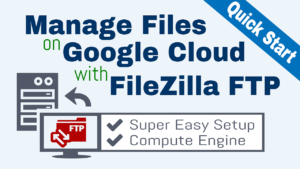 After that, you will have to upload the certificate files to your server (FileZilla tutorial), then add their file paths to your config file (same as in this tutorial). I am through everything up to step 6. However, I do not have an apache2 directory as a part of my install, and as such, I don’t have the bitnami.conf file accessible. Any ideas if this is something I may have missed during set up? Could you tell me a bit more about the stack that you’re using? If it’s a standalone LAMP stack as opposed to one of the pre-configured solutions, the configuration will be slightly different. Either way, you will have to put the same directives in your Apache .conf file, though it may be in a different location. Step 6: I just copy and pasted three time. then i read comments and ssllabs.com suggestions. Great Abdul – I’m glad you were able to resolve the issue! Thanks for all the help. I’ve been following a lot of your videos around GCloud and they’ve been incredibly helpful. I have run into a bit of an issue, though. I followed along your SSL Certificate Setup for WP on GCloud Bitnami, but I also have a Comodo SSL certificate on my domain as well. It looks like the one we installed in this tutorial is overriding my Comodo certificate because I’m getting the Chrome Privacy Error. How can I easily uninstall the SSL Certificate that we did in this video? I’m glad the tutorials have helped! I ran a test on your domain, and it is showing that you’re using a self-signed (default) certificate. To choose which certificates your server uses, you have to add the file paths to the certificate files in your Bitnami.conf file (as shown in step 6). Thanks for that. It seemed to only get me halfway there. I was able to direct it to my certificates and Chrome is displaying a valid Comodo certificate, but I’m getting an “i” instead of the green lock with the message “Your connection to this site is not fully secure”. If you haven’t resolved the issue yet, what is the domain that is causing the issue? nano /opt/bitnami/apache2/conf/bitnami/bitnami.conf , vitual host 443 does not show up where I can enter the # sign to comment out bitnami’s SSL certs. Can you tell me how to find bitnami’s SSL in port 443 so I can comment it out and enter my SSL cert numbers? Up until that point, everything is fine. Hey thanks! I figured it out. Very nice website!!! I Got ” Apache2 Debian Default Page ” Error. Ok sounds good, let me know if you have any questions! Why this error showing always ..
You will have to troubleshoot. Try restarting your server using the the ctlscript command listed at the bottom of the tutorial. The terminal will likely return a message saying what the error is; which probably has to do with a conflict on port 80. Copy and paste the error message into a Google search and see what you can find. Also, please let me know if you’re able to find the solution to the problem. Now this time Above error showing after when I run the commands as you told me.. It seems to be a common problem with Bitnami stacks. Based on Bitnami’s forum posts relating to the issue, it appears to be an issue with the Bitnami configuration itself, one in which Bitnami’s developers are aware of. The forum posts seem to only provide temporary solutions – so you should try and discover which solution works best for the long term. Hi, thank you for this tutorial, but on the step 6 to configure the certificates I had an error, do you know what could have been? After clicking enter for “nano /opt/bitnami/apache2/conf/bitnami/bitnami.conf” look what happened. ” Default Virtual Host configuration. And now my website is also not working anymore 🙁 help please. http://www.marinaficcio.com is currently unable to handle this request. PS. I did transfer the domain. When you entered the command nano /opt/bitnami/apache2/conf/bitnami/bitnami.conf this opened your bitnami.conf file – which is what you have pasted in this message. However, it looks as though you may have deleted/altered some important sections of the .conf file, which is why your server is now showing a 500 error. If you recently took a snapshot of your site, I would restore it from there. Another option of last resort is to copy and paste the default virtual host configuration back into your .conf file. I’ve pasted a default virtual host file (with SSL configured) below for your use, however, you will still need to configure the conf. file to work with your website’s SSL based on the tutorial. Also, make sure to copy a backup of your .conf file before editing it. Hi Leron, I didn’t know about the snapshot, I will do it from now on. Thank you very much for your tutorial and help, now is working perfectly!! Your videos are the best by far! Thanks for the guides Joe! Thank you so much! You saved my life! haha It’s worked!!! I have not installed bitnami. i have install 1 click deploy. what should i do ? But it doesn’t work, please tell me how to get the path of the website’s root directory in Bitnami (what commands I have to type in this ). To verify this, run sudo ls /opt/bitnami/apps/wordpress/htdocs/ to verify that there are files present inside of that directory. Thanks for the post! It is awesome. How can I find out my website’s root directory path, is it the same as your if I also host wordpress on google cloud bitnami? And when I installed google cloud SDK, it showes the error : failed to fetch component listing from server. Could you advise? thank you! 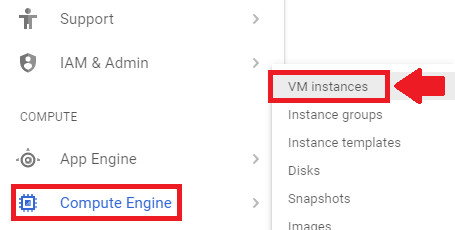 The Click-to-Deploy and Bitnami versions of WordPress on Google Cloud have different root directories. And the same for all the files of http://security.debian.org. Is this a new WP on Google Cloud installation? Try using the wget command to retrieve the Cerbot files instead, as shown in this tutorial. I tried it again and it worked! Thanks! I already have install comodo ssl on my old server. in which step i have to follow in Bitnami Google cloud platform? is this i have to regenerate my SSL again? Are you trying to transfer your old certificates to your Bitnami installation? If so, you would need to upload the certificates to your server, then add the directory paths to your bitnami.conf file. You would not need to worry about the auto-renewal steps, because this service is not offered with Comodo certificates. Yes, I am trying to transfer old certificates to your Bitnami installation. and just regenerate my Certificate. Waiting for approval. Please let me know if you have any suggestions for future tutorials. Hello Leron, my site did not receive the certificate. now it is ‘Not Secure’. I think I did everything right. In wp-admin the secure connection appears. While on the page no. What is going on? I took a look at your site and checked your certificates and they appear to be configured properly. Additionally, all of the pages I visited on your site are being served via HTTPS. Mixed Content: The page at ‘https://elfichero.com/’ was loaded over HTTPS, but requested an insecure image ‘http://104.198.60.213/wp-content/uploads/2015/12/El_Fichero_color_200-90-01.png’. This content should also be served over HTTPS. (index):146 Mixed Content: The page at ‘https://elfichero.com/’ was loaded over HTTPS, but requested an insecure image ‘http://104.198.60.213/wp-content/uploads/2015/12/El_Fichero_blanco_200-90.png’. This content should also be served over HTTPS. You need to change the filepath of the unsecure content so that it is served via HTTPS. A syntax error means that there is a “spelling error” on that line. Jump to line 51 in nano (using ctrl+shift+-) and double check that the cert files are entered appropriately. Your certificates are configured fine, however your domain is directing to the WWW-version of your site. This is a problem because the WWW-version of your site is not listed in your SSL certificate files. In this case you have 2 options. The first is to re-issue the certificates and include both domains: -d websource.today -d http://www.websource.today. The second option is to change your WordPress Settings > General URLs to match your preferred domain, which in this case is websource.today (not http://www.websource.today); this is from step 7 of the tutorials, “Update Domain URLs”. Is wild card ssl possible through this procedure, if yes then how ? If not then can we create ssl for multiple subdomains . Please explain the procedure and also keep on adding for more subdomains. Add all of the domains and subdomains that you want secured to the certificate issuing command (STEP 4). To secure a domain with multiple subdomains, you would enter: -d mywebsite.com -d http://www.mywebsite.com -d test1.mywebsite.com -d test2.mywebsite.com -d test3.mywebsite.com. LetsEncrypt does not offer wildcard support, so to add additional subdomains in the future, reissue the certificate and add the additional subdomains to the certificate issuing command. Also – Wildcard support is coming in 2018. 1. I have already created certificate for http://www.mywebsite.com and mywebsite.com so do I have to delete that certificate and reissue certificate which includes the these two and the other subdomains. 2. Every time I add a subdomain I will have to include all the previous domains in step 4. 3. Do I have to do any thing else besides above step. I really appreciate your help in solving our problems. 1. That is correct. You don’t have to ‘delete’ the certificates – just run the command to issue new ones, and you will be asked to overwrite the existing certificates. htttps://test.example.com/ will map to https://www.example.com/test/ , I don’t want a redirect the address bar should show https://test.example.com/ and also the https should work. I am asking you as you have a great authority on this subject. This is a DNS issue that normally happens because your instance switched IP addresses after it was restarted. Did you reserve a static IP address for your instance? Also, does the IP address in your Cloud DNS records match the IP address that is connected to your instance? Check out step 1 from this tutorial about static IP addresses. I have checked. The IP address and the DNS match. I also have changed from ephemeral IP to static IP address, but I still got the above message when I restart Apache. Is it a good idea to go once again over the steps in this tutorial? This solution was proposed via YouTube by user Belkacem Taleb. …. mmh? none of my sites have auto renewed, in case you have a suggestion or fix? I will fix the tutorial so that people aren’t saving the Certbot files in the tmp directory. After this, the new Certbot files are located at /etc/letsencrypt/certbot. 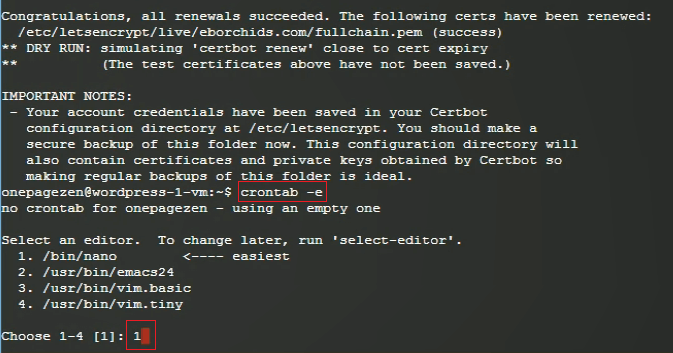 Now edit your existing Crontab file by changing the Certbot directory path. Have bookmarked this page to check in for your new tutorial update. I made the changes to the command – thanks for pointing that out. I will make these updates to both of the SSL tutorials! I followed the tutorial and got the certificates installed. This week, I noticed that the certificate was not auto renewing so I followed the instructions above. Can you help me figure out where I went wrong with this. I am not sure auto renew is now working. How can I verify that is working? Check out my response to Isabel for the solution on how to manually renew certificates. Don’t bother with the cron-job; auto-renew isn’t working and I am currently investigating the issue. I will post on the new version of the tutorial with the updated cron command. I am not sure what I am doing wrong. I am following the instructions you gave Isabel above. Thanks so much. It worked great. Really appreciate your help!! Now I just have to remember to renew every 3 months. I just published a new tutorial on how to configure auto-renew. If you do follow the tutorial and run into any issues, please let me know. the same also on the permalinks page. 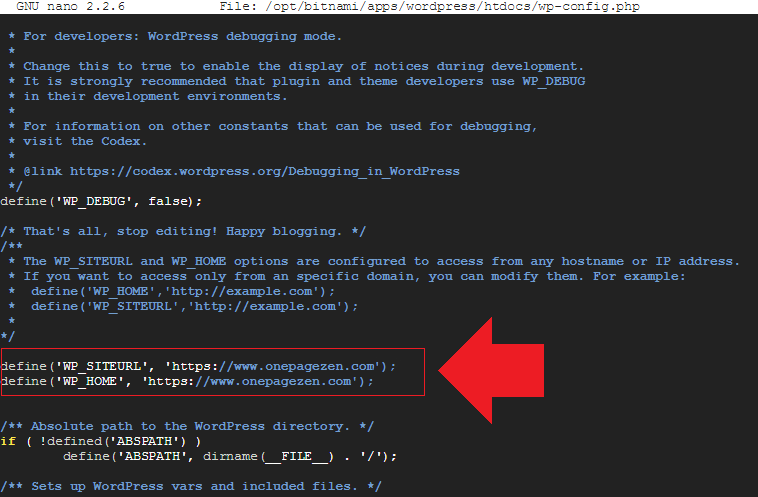 You can change that by editing your wp-config.php file, as shown in this tutorial here. Thank you so much for this awesome tuts, I mean the whole series. everything worked fine except when I open my site on safari it says safari can’t verify the identity of the website. No problem at all on chrome, this happened on safari only. do you know why this happened and how to fix it? What is the domain name for your site? I will take a look. I just ran the homepage in Safari and it is loading as secure. Additionally, the certificates appear to be configured correctly. Was it just a certain page on your site that was showing up as not-secure in Safari? should I ignore the warning in my safari browser then and click continue. I am not sure about the not secured page I just did a fresh install following your amazing tutorial. Follow the instructions in the tutorial from my last comment. After you change your domain URL’s on the settings page, it may fix the problem in Safari. Is it ok to add? for each domain then add a host? Yes – that seems like the best way to do it. You should be able to configure all of your domains in the single certificate file, as shown here. Hello, Been following your tutorial, very good. I also encountered the problem that run into some other users – NUMBER 4. After about half of a day research, I found the correct path. Here is the final command that installed my certificates successfully. Hello I have this error – where I can find line 51 to edit it ? Jump to line 51 by pressing CTRL+SHIFT+- Then enter 51. Here you will see the syntax error that you need to fix in order to fix the certificate issue. Thanks for your answer , I have resolve that error but right now I have another error with SSL certificate , please visit my website https://www.drandreea.ro . I think is an error because it say that the website is not safe . The issue is that your website is serving mixed content – the SSL certificates, however, are working just fine. You need to go to your website, right-click and choose inspect/developer tools, to see which of the page elements are being served over http instead of https. Then you need to change the path to these elements to be https instead of http. I have do that and I dont find any http on my website . Everything is https … Can you please verify too if you have 1 minute ? https://www.drandreea.ro . If you open the website from mobile device you must make a lot of steps to open the website it say unsafe website . I visited your website on mobile using safari, and it did indeed show your certificate as invalid. I don’t know the solution to your problem, as it shows your certificates are configured properly, and this is not a problem I have encountered before with the LetsEncrypt SSL Certificates. Did you change your WordPress URLs on the WordPress settings page? First of all, I want to say thanks for sharing such a valuable content. You saved my day. I am very glad that the tutorial helped you! Thank you for your nice tutorials. Have you heard of this error before? Do you have any ideas what is causing this error? There have been a couple of people before you who’ve experienced this error. Were you able to find a solution, or did you reconfigure the site from a backup? Hey Thomas, I had a similar problem with apache. ¨(98)Address already in use: AH00072¨ Tells you there is something else using that port. Before restarting an instance, you should make sure you have a static IP reserved for your instance, as shown in this tutorial here. Without a static IP reserved, your instance will change it’s external IP, causing the default Apache2 page to appear. I looked at the certificate configuration for your site, and it looks fine. It loaded secure in my browser! I checked the ip is static. I think maybe it has something to do with the port 447 but I´m not sure about it? Hello Joe, thanks for for your great tutorial. I have configured SSL following your instructions, I believed everything was fine. Today I entered in SSH console and saw a “You have new mail” message. I used a ‘mail’ command, and there are many message I think they are telling me something is wrong with the cron for renew the certificate. Do you know how to troubleshoot this? It appears to be a renewal error related to the install directory. It was php syntax error which I found by going through the Apache error_log file . I copied the commented example.com example given on the wp_config.php file and changed it to my domain and now it has started working. I compared the previous statement and this statements and was unable to find any difference , but now it is working so I don’t want more time to spend on that. Is there a way to check cron job’s report I mean what it has done. Thanks for letting me know about the error, and I am glad you were able to find a solution! There’s a great post from LiquidWeb here about checking cron jobs. the I start getting the error msg 500 and after that I again changed the file with the original definition but still I am getting the same error. Mine was a syntax error in wp-config.php file . See the comment below. Yep! Totally a syntax error… Thank you for figuring that out! In step 7 there are some single quotation marks in the copy-able text that should be apostrophes. Thank you Mike and Tarun for bringing this error to my attention. I’ve fixed the problem in the post, so hopefully people won’t get this problem anymore! Hi, maybe you need to change on step 7..
remove the slash at the end of the ‘.com’ or else you will be getting http 500 error. Took me to redo whole process only to realize single ‘/’ was added into the code line. Thanks btw, very good tutorial. Thanks a lot for pointing this out! I changed the steps so hopefully people won’t get the error anymore! Need to get 219 kB/109 MB of archives. After this operation, 420 MB of additional disk space will be used. Check out this thread for some information about how to fix the problem. It could be several problems, but you’ll have to do some troubleshooting to figure out what works. Also, speaking of DNS, make sure you reserve a static IP for your instance under networking > External IP Address. Let me know which solution works for you. If you can’t find a solution let me know and I will see how else I can help! The instructions provided are stellar and THNAK YOU! I do get the certificate to install and the SSL enabled pages DO appear. The issue is that everytime (this is my 3rd time) I restart the service instance, it reverts back to the Abache Debian default page and I cant seem to find out why. Has this happened to anyone else? I’m glad that you’ve found the tutorials helpful! The first thing you should do is go to your Google Cloud Dashboard, open up the main menu by clicking the hamburger menu in the upper left-hand corner of the screen, and going to Networking > External IP Addresses. Once there, make sure that your instance is using a static IP address, not an ephemeral IP address. This should hopefully take care of the problem. Everything works great till I restart the server. What does the top of your bitnami.conf folder look like? Specifically any lines that involve the number 80. The reason the green padlock isn’t showing up is because your page is still loading many images, videos and plugins via http:// instead of https://. If you’re using chrome as a browser, you can view which elements aren’t being served via https:// by entering CTRL + SHIFT + I to pull up the developer console. Now that you’ve configured your certificates, you will need to tell WordPress to serve your content using https://. Did you try issuing the certificates more that one time? Let’s Encrypt limits the number of certificates it will issue within a certain time frame. If this isn’t the case, check out the log files (as shown in the error message for more info). Let me know if you’ve figured it out, otherwise I will see how else I can help. Where I find the root Directory in google cloud? I am stuck on PART 4 because of that. If you’re using the Click-to-Deploy version of WordPress on Google Cloud, then your webroot will be /var/www/html/. If you’re using the Bitnami version, your webroot is /opt/bitnami/apps/wordpress/htdocs/. Hello I loved this tutorial first of all. After I did all those steps it does show however in https but it says it is not full secure yet. What likely happened is that your site started serving mixed content. Perhaps you added a new photo to your site that was loading via http instead of https? You can check for mixed content (if you’re using Google Chrome) by right-clicking and going to developer tools. The console that is loaded will show errors if there is mixed content. So you are saying that this is my browser’s fault? also i do not undertand exact steps you told me. First of all, your tutorials are fantastic, love them :). Very clear and easy to follow. I haven’t actually implemented this one yet but I plan to give it a try. I have a question if you don’t mind. Would these steps also work for a Moodle (LMS) installation? so using a Bitnami installation, for configuring and then setting up an auto-renewing SSL certificates for Moodle websites that are hosted on Google Cloud Platform. The steps should be similar, however they will ultimately be different because they Moodle directory structure will be different. Also, I’m not familiar with the Moodle stack but I’m sure Bitnami has great documentation on how to get it set up. I will see about doing some Moodle tutorials in the future. Based on the documentation, it looks almost identical to the WordPress configuration. Perfect! Thanks for your tutorial. Now my site running with green padlock. In the future how do we know if our ssl has been renewed? Is there an email to us? I am not sure how to set up email notifications, but your certificate will renew itself before expiration. Other things, why Bitnami or GEC does not redirect the www or non www version. Can you create a tutorial how to write .htaccess file via ssh? You can configure which version you want to be displayed in your htaccess file. I will make a tutorial on it, but check out this guide in the meantime. Let me know how else I can be of service! Thanks again for all your help. Hands down, best tutorials on the Google Cloud Platform for WordPress users. I was able to get the certificates installed, but I notice that the my site isn’t loading properly after the certificate install. My site is recipe-costing.com and looks like some of the .css files are not loading correctly. Any ideas or suggestions. Also, do you know how to access myphpadmin within Google Cloud Platform? Okay, updated my permalinks and that fixed the .css issue. Now, I just need to access myphpadmin. Do you know where it’s located within Google Cloud? Follow this tutorial from Bitnami, it should help. If you’re not using the Bitnami install, let me know and I will see how else I can help. Thanks for commenting and thanks for all of your helpful comments in the past! What I would do in your situation is call GoDaddy support (480) 505-8877 and get one of their technical staff to walk you through the issue. I checked your domains on multiple SSL test sites and they all list it as configured properly, but I loaded the site on Chrome (ios and Windows) and the site isn’t loading securely. I don’t have a great deal of experience with securing multiple domains. Let me know how else I can help, and let me know when you figure out the solution as I would be interested to learn about how you fixed it. 1) How do i force the site to output with the www prefix? I plan on doing a tutorial on this but if you want to force your domain to always load with www. prefix, check out this tutorial. For the tutorial to work, you need to have access to your htaccess file, which can be done manually in the console or by configuring an SFTP client for your instance. If you give it a try let me know how it goes! 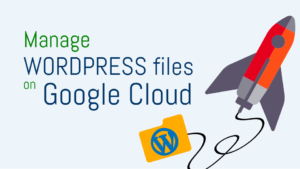 First of all thanks for your blog posts about google cloud wordpress solutions. I am using google cloud wordpress but not bitnami, i am using click to deploy. And i want setup ssl sertificate. This article very helpfull for bitnami. How can i setup ssl setificate for click to deploy wordpress on google cloud ? The steps are similar however your root directory is different. How do I determine my websites root directory? Assume I know nothing—because I don’t! Also, when you ask for my domain name does that include the www. if I am currently using it? The root directory of your website will depend on the which WordPress deployment you’re using. If you are using the Bitnami WordPress install, your root directory will be the same as in this tutorial. If you’re using a standalone or multisite WordPress install, your root directory will be different. Let me know which version you are using and I will help you find your root directory. I am using google click to deploy wordpress plugin. Will you pls help me with the root folder. Hi I am using multisite , how do i determine my websites root directory? I don’t know the root directory for Multisite. You’re looking for the directory that contains index.php. Are you using the Bitnami WordPress install on google cloud? If not, the filepath to your conf folder will be different than what is used in this tutorial. If you’re using the Bitnami version and are still experiencing the error let me know! SSL Test , Why The certificate Not Renewing Daily , it’s Expiring on 1 month, Is my crontab step is not done perfectly ? Or will it Renew Itself on the Last day of The Renewl ? The Certbot only checks if the certificate requires renewal. It will only renew when it is set to expire. Also, thanks for posting so many great comments. Many of your comments are very useful and I really appreciate them! Does that mean that if the chron jobs are set up correctly, the certificate will be renewed prior to expiry so there is no loss of coverage? Or does it mean that the chron jobs can only update the certificate once the certificate has already expired (meaning that there will be loss of coverage)? P.S. Great tutorial, worked for me first time! Certbot will only renew the certificates if they are due to expires in less than 28 days. And yes – if it’s configured correctly (according to this tutorial), there will be no loss in coverage, as the certificates will be automatically renewed before their expiration date. To further elaborate: in this tutorial, the cronjob is set to execute once weekly to check for renewals. If the script executes and determines that the certificates aren’t due for renewal, they simply won’t renew. This process will repeat until [eventually] the certificates are due to expire in less than 28 days. I believe it has to do with the bitnami.conf file. Here is a copy of my bitnami.conf file, for the time being, I have commented out the Rewrite because if it’s not, my site is down with that error on the screen. Please advice, the error page does have the ssl certs working! But not loading the site. Crap, it didn’t paste all the code, if need be, I can send it to you for help. Your site appears to be loading fine and the SSL certificated appear to be configured properly. Were you able to resolve the issue, if so, how? I worked according to the provided commands in https://www.youtube.com/watch?v=DBnQkH1v-Xw, yet there is no green bar on my site. Can you please help me? Everything worked well. I deleted everything and now it works fine. Your tutorials are really helpful. Thank you for sharing this tutorial. It worked and I have free ssl now, but I have a problem with SSL. Why is my “https” turn into green only when I login to wp-admin and the “https” turned into grey when the whole website and there is exclamation mark on it? You might be serving unsecured files on your page. Go the page that is loading “grey”, and right-click and select “inspect” (do this in Google Chrome). In the “inspect” console, you will see an error saying that your site is serving mixed content. Find out which images are causing the error (it will show their file paths) and edit the existing filepaths from http:// to https://, or, simply remove the http and serve the file starting with www. only (recommended). Thank you for your tutorial series on installing Bitnami WordPress on Google Cloud. Your style is easy to follow! I am stuck on finding the path for my root folder as outlined in step 4 above…and unfortunately I’m getting lost in the details to the stack-overflow link. As someone who learned BASIC in the 80s but hasn’t done much coding, I can usually follow along as in your videos but in this case I’m lost. Can you help me out? I’m running the basic Bitnami install as outlined in your videos. Please disregard my last question…I took a chance that my root was the same as yours, and everything from there worked like a champ! I am glad that the tutorial worked for you. Please keep me posted if you have recommendations for future tutorials! Again, thank you for these instructions. I have set up the SSL just fine, but bumped into a problem that I can’t wrap my head around. The site url inside WordPress is actually an IP address. And I can’t figure out how to change it into a domain name URL. The field is greyed out. How have you changed yours? Is there a step that I missed somewhere? Did this problem just start after you configured the certificate? The first thing I would do is go back to this tutorial and make sure that your DNS records are configured properly on both Google Cloud and your Domain Name Provider. After you’ve generated your certificates, open a new SSH window and type the following commands. This should take care of the directory issue. Let me know if this works. If it doesn't, let me know and I will help you through it. There is a syntax error in your Bitnami conf file. This likely occurred when you were editing the certificate paths and you may have added files with the wrong extension. The first thing you should do is go back to the video and look at the configuration in the video tutorial, and make sure your line 51 matches the same syntax as in the video. Type CTRL/SHIFT/- to jump to a specific line in your file once it is open in Nano. I had the same error. I had copied and pasted the SSLCert lines directly from your tutorial, then updated the domain. It turned out the problem was how the ” char pasted. I deleted the ” and entered them in manually – then everything worked. Thanks for sharing the solution – I know many people will find it helpful! What issue are you having after step 6? I think it’s great that you were able to figure out the solution to these issues on your own, and that you spent the time to post your findings in order to help others. It is very much appreciated! I will use your suggestions to update this tutorial to make it that much better. I’m still having the same problem! I’m glad the tutorial was helpful to you! Thanks for taking the time to post a comment, and let me know if you ever have questions or suggestions for future videos. Thanks so much! I’m glad you were able to get your certificates working! Please let me know if you have suggestions for other videos, or if you ever have any questions or concerns with your WordPress on Google Cloud installation. Let me know if this helps, or if you have additional questions. I’ve got the same problem, the ssl chain that’s not in the frontend. I really need you help. Would you please describe the issue in more detail? As I have a page that has ssl chain on it, then I’m uploading a new photo to insert to that page and the ssl chain does not work any more. How can I fix that? This problem occurs when the image that the website is serving isn’t secure. If you’re using Google Chrome, type ctrl+shift+i to view the page source console. Within the console, it will show you which of the images are being served in an insecure form. To fix the problem, locate the photo that is being served and in your code, remove “http://” from the beginning of the file path. Got it, Leron. I did change the website’s URL to ‘https’ in the dashboard and everything’s fine. Thanks for supporting me, bro. Hi thanks for the tutorial, but when I put in this command cd && ./certbot-auto renew –dry-run the console says “No such file or directory”. And Chris, I think you mentioned to me on YouTube that you figured it out. Let me know if you have any issues with the configuration in the future. I saw from your latest comment that you figured out the issues and got everything working. Also, thanks a ton for letting me know about the errors and suggesting improvements!